Growing up my family would often spend its summer's in North Carolina, nestled away in my grandparent's mountain cabin. And every summer we arrived, grandma would have those red, plastic floral hummingbird feeders hanging in view of every window. Each time a Ruby-throat would dart up and quickly feed, we'd stare on in awe of how fast such small wings could beat. And how absolutely shiny such small feathers could be. During the height of summer, when the hummingbirds were glutinous for feeding, watching out those windows for their visit would be daily entertainment. You were too afraid to leave the table because in a blink they were there and gone. A migratory bird, Ruby-throated hummingbirds offer a sure sign that warm weather has arrived. And carry on throughout the heat until returning home during our east coast's winter. Easy to attract and even easier to feed, this beautiful hummingbirds can be darting about your kitchen window's in no time at all. 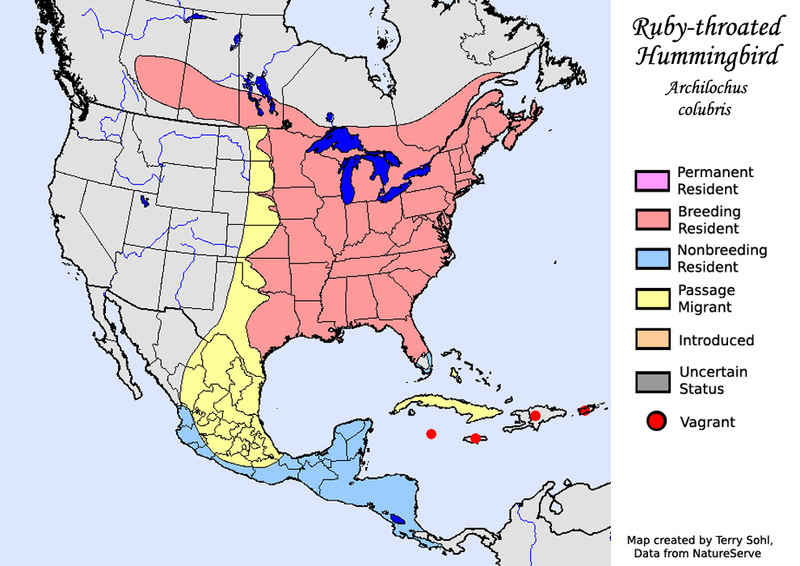 Ruby-throated hummingbirds are migratory, making Mexico and Central American their home during winter. Once the warmer weather hits, this species can be found throughout eastern North America, as high up as Canada and as southern as Florida. While they primarily live in woodland areas, ruby-throated hummingbirds frequent flowering gardens, parks and backyards during the height of summer. As omnivores, these small birds live for the sugar high by feeding off of flowers, nectar, sap. Neat enough, many plants are pollinated by their feeding process. Hang a hummingbird feeder outside your window and they’ll frequent that too - all you need for quick refills are of the most basic kitchen items: sugar and water. And seriously, feed and they will come. Hummingbird visits can so easily become a seasonal high point I think, because these busy bodies are not only frequent eaters but loyal to their feeders. As they dart rapidly back and forth, hummingbirds burn up a great deal of nourishment from sky-high metabolisms. By this, adults can eat up to twice their own body weight in a day. So keeping your own at-home feeders well stocked means that catching their beauty out the window proves to be a high probability and and provides a sort of friendship with the bird. 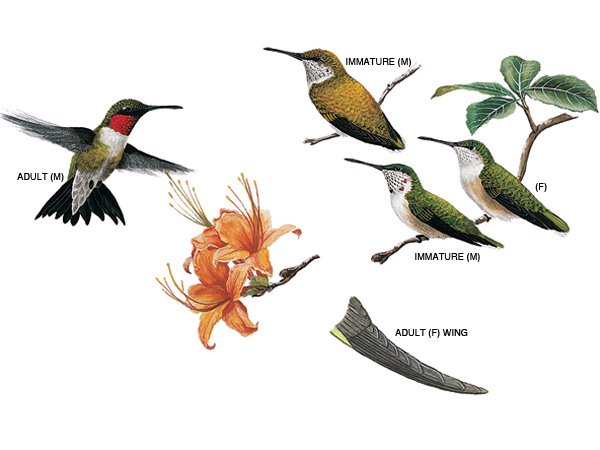 Ruby-throated hummingbirds are actually the only of its kind to breed in our eastern North America. After embarking on their cross-coast flight marathons during migration, males are quick to establish their territory before the females arrive. Once the females arrive, these males quickly court their partners through incredible feats of flight. Specifically, these males often perform a “dive display” to their lady of choice: darting up to 10 feet above and 6 feet wide the perimeter of the female. Once he has her attention, a quick arc like motion keeps him busy until she’s made her interest clear by giving him her number. No really its just one, sexual perch of solicitous that does the trick. For breeding, almost walnut-sized nests are made and adorned by surrounding moss and fungi and then bond by spiderwebs and plant fiber. Often well hidden, these nests may be used for several seasons with just a few home improvements to be made each year. Along with all other hummingbird species, the female alone is responsible for building the nest and then tending the young. Females often lay two, ranging from one to three, eggs per season. Twenty-two days later, the young leave their nest for the first flight. 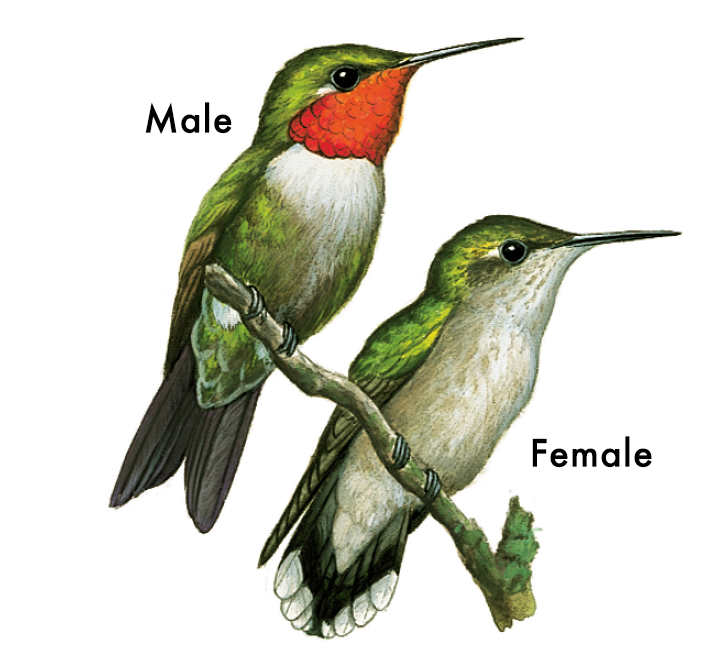 The average life span of male ruby-throats is about five years, and then a longer seven for the females. The earlier death for males is assumed to be due to their extensive energy requirements during migration and while defending territory. Because these birds are so small, they also make easy targets for looming predators. At least predators fast enough to catch them. The ruby throat of this hummingbird belongs solely to males. This shimmering, colored throat patch is definitely more striking at certain angles and in full sun, which can otherwise appear more dull. Fun fact: the color of the rubythroats’ feathers is due, not to pigment, but to crystalline structures that refract sunlight. The male bird is a bright emerald green or golden and green, with a black chin and forked black tail. The female has a more noticeable notched tail and feathers of similar greens, reds, and black. The larger female bird is often marked with dusted stripes along its backside, and sports a bigger bill. True to their speed (and name), these hummingbirds can be heard by the faint sound of rapid wing movement. Males often exhibit a louder and higher-pitched hum, moving about more quickly than the females. Their common call is rapid like their motion, repetitive piping chirps exchanged between individual birds or during threatening chases. 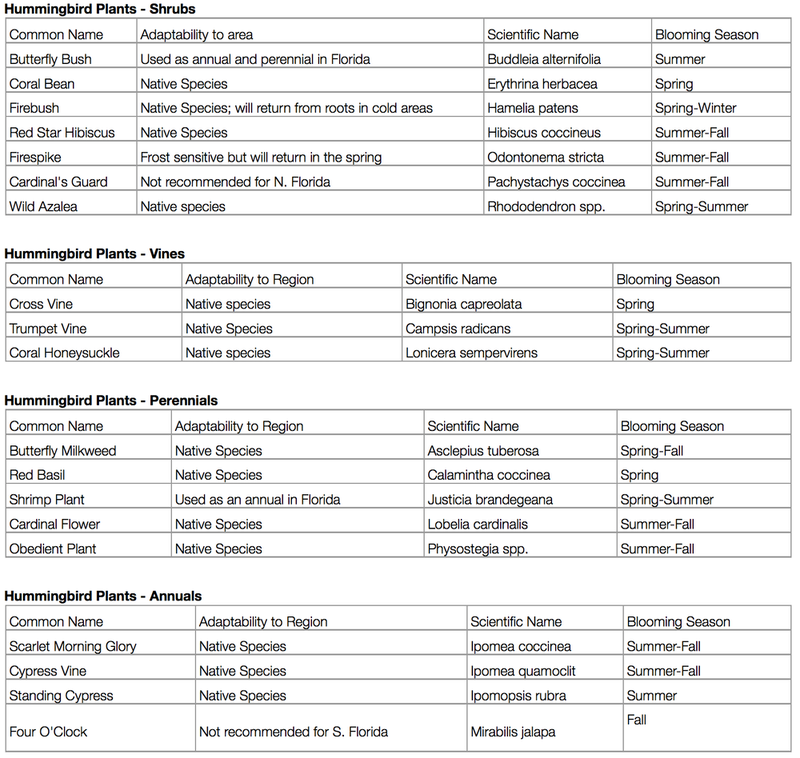 It’s fairly easy to attract ruby-throated hummingbirds to your yard, and requires few components. Hummingbird feeders, plastic or otherwise, are easy to come by and can be hung virtually anywhere. Fill your feeders with 1/4 cup of table sugar per cup of water and never use honey or artificial sweetener and definitely do not buy the red dye nectar you find in stores, as that is just another chemical that may harm the health of hummers. Depending on how much traffic your feeder gets, you may need to refill often as hummingbirds are heavy eaters. Just be sure to monitor the clarity of the water and not to let it sit (and ferment under the summer sun) for too long at a time. We suggest cleaning your feeders about once a week.